Don’t confuse decorating with home staging. That’s the mantra home staging expert Lori Matzke repeats to clients. You may love your kitten statues and retro lamps, but when selling your house, they can be a distraction. Potential buyers should be focused on the fireplace, not the items crowded on the mantelpiece. 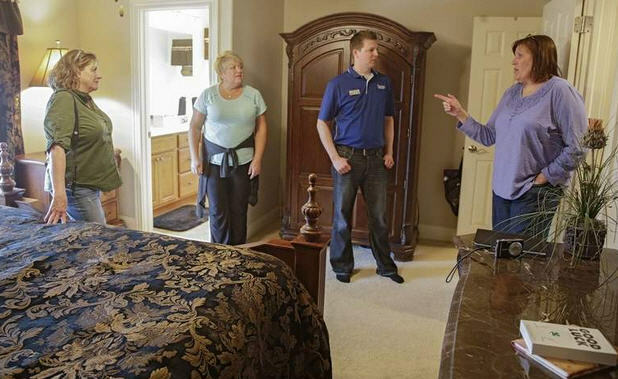 Matzke, founder of Minneapolis-based Center Stage Home, led a workshop for 12 Cedar Rapids real estate professionals Monday, directing them as they transformed Rick and Cyndi Sievertsen’s home at 5600 Shiloh Lane NE, Cedar Rapids. The Sievertsens are working with Skogman Realtor Debra Callahan to sell the home. Good staging can add thousands of dollars to your final selling price, Matzke says, or can mean the difference between your home selling or sitting on the market. The team at the workshop was merciless, hiding oodles of fake ferns, sculptures, wreaths, candles, vases and lamps in a basement storage room. Their goal was to simplify the space, leaving room for a buyer’s imagination. Professional home stagers sometimes bring in new furniture and accessories, but the workshop team could use only what was in the home. The items are not as important as how they draw the eye around the space, Matzke says. The students swapped furniture between rooms to create flow and continuity. The main floor living and sitting rooms, full of modern art, didn’t match the more dated basement family room, so a glass table was moved downstairs to modernize the space. Matzke wants all three floors to look like they belong together. “Every room should have a purpose,” she says. Formal sitting rooms that look like they’ve never been lived in just appear as wasted space, she says. Mixing and matching furniture between sitting rooms and family rooms can make both look welcoming. She recommends standing in the entrance to each room as you plan your layout. If that means moving the TV to a less central location or rearranging couches, so be it. “In the first 30 to 60 seconds you’re going to capture that buyer, It’s not about how you sit and live in the room. You need to get them into the room in the first place,” she says. In the basement family room, the agents cleared clutter from around the entertainment center. Matzke recommends hiding anything smaller than a football. She stopped them from adding even one or two accessories back to the top of the cabinet. That would just draw attention to the TV, she says, which is not the goal. So the team added a pop of color with bright flowers and red chairs in front of a window to draw attention to the view. Upstairs, they moved a bench to illustrate a potential additional seating area. Anything that makes a room feel bigger and brighter is a positive, Matzke says. In the master bedroom, team members flipped over a heavy black and gold brocade duvet so the cream lining underneath showed instead. Then they raised the curtains, letting in more natural light. These simple tricks didn’t require buying anything, but they made the room feel dramatically lighter. She says it’s simple psychology — making a room cheerful makes buyers feel cheerful too. If you decide to make some purchases for staging, they don’t have to be expensive to make the space feel fresh. Matzke recommends updating easy things, like paint colors and light fixtures. Basic updates can help whether you’re selling a $100,000 home or a $500,000 home. “If you haven’t picked up an interior design magazine in a decade, now is the time to do so,” she says. This entry was posted in Home Staging Tips and tagged home staging before after, home staging class, home staging course, home staging how to, home staging instruction. Bookmark the permalink.